Max compatible dimensions: 5.39" x 3.74" x 1"
Color: For 2.5" Hard Drive [Small] The Sabrent Hard Carrying Case is a durable protector for your portableSeagate, WD My Passport, WD Elements, Toshiba, Sabrent, Silicon Power,Transcend, LaCie, or other 2.5" External hard drive. 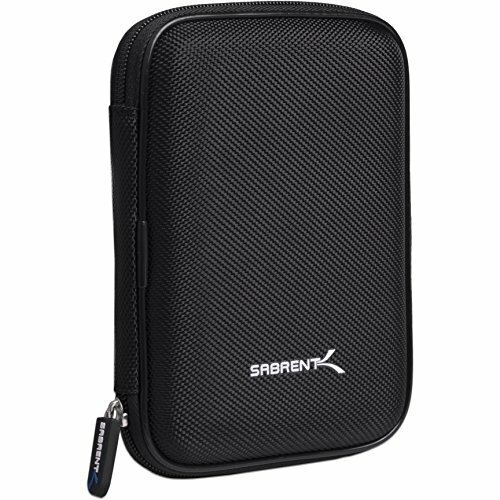 (fits drives up to 5.39 x3.74 x 1-inches), this soft-lined case features an inner mesh compartment fora USB cable and accessories. Durable Exterior and Soft Interior This durable and stylish carrying case for hard drives offers a tough exterior that protects your portable hard drive from bumps and jostles. Additionally, its soft liner keeps your hard drive's case free of scratches. Convenient Inner Mesh Pocket The case features an inner mesh pocket for a connecting USB cable oraccessories. The case design makes it easy to insert and remove your portablehard drive, which is ideal for when you're on the go--and the inner meshpocket lets you conveniently store the cables needed to connect your harddrive when you need immediate access to your data. Package contents Sabrent Hard Drive Carrying Case Warranty: This product comes with a three year warranty. In order for us to properly assist you, please follow these simpleinstructions: Go to and click 'submit a ticket'. Submit your ticket. You must include your Amazon Order ID number in the subject line.